Make the sauce: Put dried chiles in a bowl and cover with boiling water. Let sit for 10 minutes. While the chiles are soaking, heat a large, heavy-bottomed skillet to medium-high and add oil. Add onions and cook for 5 minutes, until softened. Add garlic and cook for another minute. Add oregano, cumin, tomatoes and stock; cook for 10 minutes. Remove tomato mixture form heat and let cool for a few minutes. Add tomato mixture along with drained chiles to a blender and blend until smooth. You may have to do this in batches. Set sauce aside while you prep the meat. Heat a large, heavy-bottomed skillet to medium-high. Season meat with salt and pepper and sear on all sides until meat browns on the outside. Once meat is browned, add to your slow cooker. Pour sauce on top of meat and cook on low for 7-8 hours, until meat is fork-tender. Serve warm. 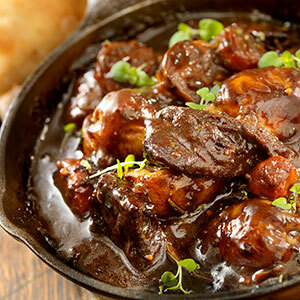 This spicy stew of slow-cooked beef is just so soul-warming on a chilly Winter's day. Making this dish is a bit of a process; we've pared down the ingredients from the traditional recipe to simplify the prep work. Serve topped with a bit of sour cream and shredded cheese, in a taco or with warm tortillas - it's all good! This recipe makes 8 servings.